Holiday Inn, Saratoga; intersection of Rts 9 and 50. A frosty morning and brilliant sunshine illuminated a rolling and looping course through beautiful Chenango Valley State Park, setting the stage for a great day of racing. The Class B girls, with Burnt Hills on the line, started the day off at 9:00. Eva and Rory ran right in the midst of the top packs, with Eva crossing in 5th (2 pts) and Rory in 10th (4) to both earn podium medals! Congratulations!! Coming up behind them was Emily B making her way to 56th (28), Kristin 70th (33) Lily 74th (35), Skylar 79th (40) and Monica 87th (48), all putting in tremendous efforts. Overall the team came in an excellent 4th place finish among the 12 best Class B teams in the state and 13th overall among the 41 total teams. The boys surged off the starting line at 11:00. As they came in to the finish it was Evan in 6th (2 pts), Tyler 14th (6) and Aidan 15th (7), all receiving individual podium medals! The team points were completed by David in 34th (14) and Mike B in 60th (24) with support from Luke right there in 65th and Nick wrapping it up to capture the title of NYS CHAMPIONS!! CONGRATULATIONS! 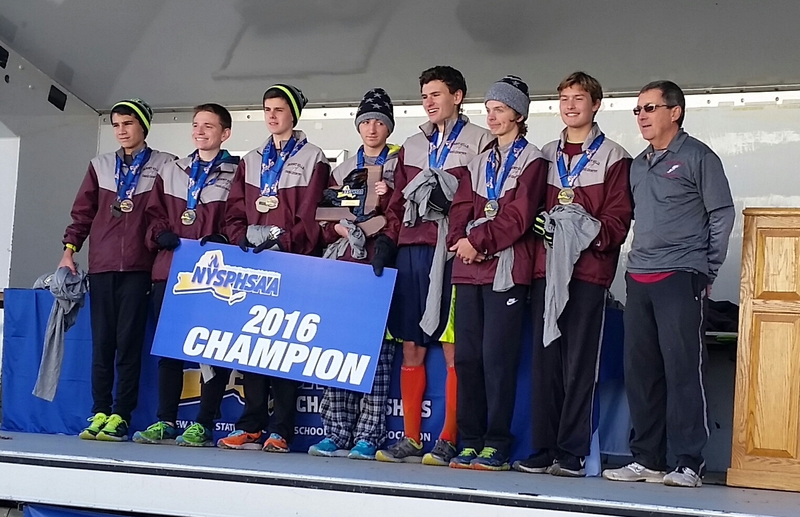 On top of that the combined runners of Section 2 also won as a team over the other 11 sections. The day was made even more special by having members of the 2004 team, who had won the NYS XC Championship on the same course, there to cheer on BH and help celebrate. Another beautiful day of racing at Saratoga Spa State Park with temperatures a bit warmer than at Suburbans. It was great to see so many teammates, family, alumni and friends come to watch both the BH boys and girls teams come out with wins! In the Class B girls race in was Eva far out in front and the first runner of the day to cross the finish line! Congratulations Eva!! Behind her was Rory in 3rd, Lily 8th, Monica 10th, and Kristin 12th, with Emily B 13th, Skylar 17th, Maddy A 19th, and Marielle 20th all coming in the top 20 of 107 finishers. The team totaled 34 points, 38 points ahead of Schalmont. In the boys race, it was Evan repeating his 3rd place finish, with the rest of the 9 BH runners filling in much of positions 6th through 20th. Aidan was 6th, David 7th, Tyler 9th, Nick 10th, Mike B 12th, Luke 13th, Mike M 14th, Kevin 16th and Ryan L 20th out of 116 finishers. 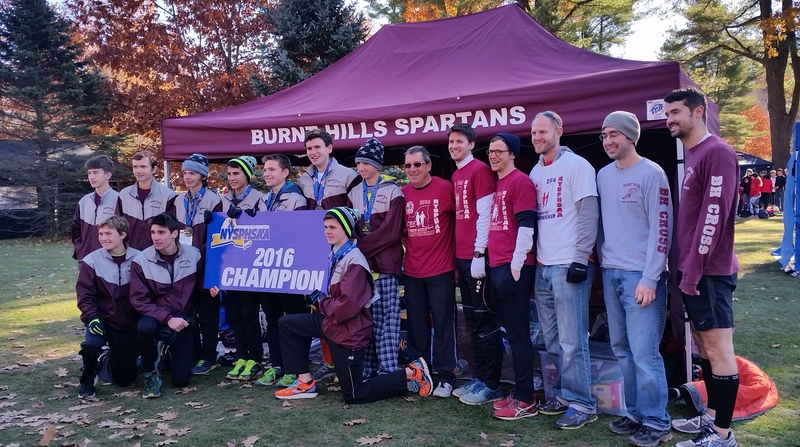 The top 5 BH runners tallied up 35 points, 41 points ahead of Glens Falls. A cool dry day and the last race of the season for most of the BH XC athletes produced phenomenal races with many new PRs! In the JV girls race, Marielle led the BH runners across in 14th, with Zoe in 30th, and Macaila, Maddy F and Anna L rounding out the first 5 for BH for an overall team 7th. For the JV boys, out of 212 finishers it was Kevin B in 5th, Ryan L 7th, Colin 19th, Logan 23rd and Bobby 24th as the first 5 across for BH, lending to a team 3rd place. In the Varsity girls race, Eva staked her place among the best, coming in 4th place, followed by a strong finish by Rory in 12th, with Lily, Monia, Skylar, Kristin and Maddy A all crossing between 40 and 55th, for an excellent team 6th place. The Varsity boys were led by Evan in 5th, followed by Aidan, David, Mike B and Nick in 13th, 14th, 19th and 26th, followed closely by Luke and Mike M in 33rd and 34th, powering to a fantastic 2nd place finish overall. Congratulations to every one of you on a great season of many accomplishments and successes. We are all so proud of you! Best of luck to everyone headed to the Sectional Championships! A very warm autumn day up in the 80s with a breeze. It was a cold, frosty morning with temperatures in the mid 20s at daybreak. When the first race went off at 9:30 much of the frost had melted under a brilliant sunny blue sky. The first race for our BH-BL athletes was the Freshman Girls with Emily B heating up the course in 12:28 to a 2nd place finish! Following behind her was Maddy S in 10th, Carmela in 12th, and Maddy W and Janna in 22nd and 23rd for a team Third Place finish out of 5 big schools! Well done! For the Freshman boys it was David showing the way to a FIRST PLACE finish out of 126 finishers. Congratulations David! Within 18 seconds, Dante crossed in 3rd, followed by Kevin in 4th. Rounding out the top 5 was Mikhail in 17th and Zackary in 33rd for an excellent overall team finish of 2nd place out of 10 teams! In the JV Boys ‘B’ race it was Michael M coming in FIRST PLACE, with Sean, Josh and Gabe all in the top 10 and Collin B in 23rd. Collectively they brought home a team WIN out of 12 teams! The JV Girls were up against tough teams and their efforts placed them in the top tier of the 21 team field with a 6th place finish. Lauren was first across for BH in 19th, with Zoe right behind in 23th. Behind them was Maddy F in 40th, Macaila in 50th and Anna L in 75th. In the JV Boys ‘A’ race it was a fast start for the 26 teams and over 200 runners. As the race progressed the BH runners made their way to the front with Logan taking over the lead all the way to the end for a FIRST PLACE finish! Congratulations Logan! Ryan L ran to a fast 3rd place, with Max in 7th, and Bobby and Ryan S in 13th and 14th. All tallied up, it was a team WIN! The day warmed to the low 60s by the time the BH Varsity teams came to the starting line. The competition proved fantastic in both races. For the Varsity Girls, there was a cluster of 3 up front with Eva right in the mix, crossing in 2nd of 188 runners! Rory had a fast finish for a 10th, with Skylar coming in strong for 32th and Lily, Monica and Kristin crossing as a group in 49th, 50th and 52th. It was Maddy A’s 69th place finish that broke the tie though putting BH in 5th place, ahead of R-H and just one point behind 4th. A very close race! In the final race of the day, the Varsity Boys had 5 in the top 30 of 187 finishers, earning a strong team WIN out of 26 teams! It was Tyler and Evan leading the way for BH in 2nd and 3rd, with Aidan in 7th, Mike B in 17th and Luke in 29th. Congratulations!! A fantastic day everyone! Thank you to all who contributed to the successes of the day. Cars leave Friday 9/30 at 11:30 AM from front of HS. This ever exciting day exhibited some phenomenal racing and very fast times. Burnt Hills was right up there among the top of the large pool of competition. The day began with some rain that lingered into the start of the Varsity ‘B’ Boys race, the first up for the BH runners. The race went out fast and as it progressed, BH percolated to the top of 370 runners. At the end it was Colin S with a very strong run to a fantastic 2nd place finish! Behind him were 4 more teammates all within the top 10: Kevin in 5th, Dante 8th, Logan 9th and Jack T 10th, resulting in a team WIN by 29 points! Max and Ryan L were not far behind, coming in the top 20. The Varsity Girls were at the starting line next among 147 runners and 18 teams. Eva worked her way up to a terrific 2nd place finish! Rory was next in 12th, with Kristin 27th, Skylar 34th and Lily 40th, all contributing to a fantastic overall 3rd place team finish and a trip to the podium. Varsity Boys quickly followed, building on the energy of the prior races. Tyler broke the top 10 in 8th place, quickly followed by Evan in 11th, Nick in 12th, and Aidan in 19th. David brought in the final point in 32nd, with Mike B and Luke nearby, all contributing to an overall WIN by 15 points! Congratulations!! The Girls Varsity ‘B’ race was the final race of the day for BH and they continued the fast pace with a mix of veterans and newcomers. Monica led the way for BH coming in 3rd, with Emily B not far behind in 7th out of 499 finishers! Congratulations! Behind them was Carmela and Zoe in 64th and 65th, and Elizabeth in 86th, with Maddy S and Macaila nearby. Their efforts brought a really great close 7th place finish out of 43 teams, just 4 points behind 6th. You all ran great and most of you have many more McQuaid races to look forward to. Up and down, around and around. Not a long course but hilly. Cars leave 7:30 AM from front of HS. With cooler weather having moved in it was a beautiful autumn day to race. The JV boys were first up for BH with Michael M moving up to a 3rd place finish and Dante right behind him in 4th. Logan and Kevin crossed together in 7th and 8th and Colin was close behind in 11th. Great efforts by all contributed to a very close 2nd place finish behind the host team by only 3 points. In the Varsity race, the times were fast. Coming across the finish line hip to hip to hip were Tyler, Evan and Aiden in 3rd, 4th and 5th. Nick was close behind in 7th, with Mike B coming across in 19th. It was hard to tell what the outcome might be but the BH Boys pulled off the win by 21 points! Congratulations to every one of you on your tremendous efforts and great racing today! It was off to NH for the Girls Varsity team to run against some great NE competition. Eva was first for the team, coming across in 4th place overall with Rory very nearby in 6th. Lily, Kristin and Skylar all contributed to an overall 6th place finish for the team among 32 other teams. Congratulations girls! A beautiful evening at the park. Thank you to all the parents who helped out at our home meet. It couldn’t have been done without you! An overcast morning with a little bit of a breeze for the start of the day. With a dry course the Frosh girls started off with Emily B and Carmela breaking into the top 10 and Elizabeth and Maddy S in the top 20, and Janna following up. All of the girls are off to a great start! The Frosh boys were up next where David led the field with an impressive win! Congratulations David!! Dante followed him in for a fantastic 2nd place finish. It was then Kevin in 14th, and Jayden and Mikhail rounding out the top 5 for an overall 3rd place team finish. For the JV Girls, Zoe broke the string of red for 10th place, followed in by Abby M, Maddy F and Macaila together with Anna L in 19th, resulting in an overall 2nd place team finish. With the JV Boys, Michael M broke the string of green for a 7th place finish, with Ryan S, Colin, Ryan L and Jack T bringing the team to a very good 3rd place finish among some big teams. By the time the Varsity ran the sun came out, the breeze calmed and the humidity shot up. It didn’t hold Eva back with a fantastic first place finish! Congratulations Eva!! Following her in was Rory in 2nd place! Skylar, Lily and Monica all contributed to the teams 2nd place finish behind the host team. In the Varsity Boys race, Aidan, Tyler and Evan came in nearly together in 7th, 8th and 9th and all under 16:00. Not far behind came Nick and then Mike B bringing the team to a 1st place finish by 8 points! A really good start to the season. JV boys began the events for BH under clear skies with Dante leading the field across the line in first (congratulations Dante!) and a sea of BH following. In the Varsity race, Nick, Tyler, David, Evan and Aidan all crossed as a group in first, closely followed by Michael B and Luke to round out the top 7 finishers. Please, turn in your track club membership form and dues ($25/season/athlete or $50/year/athlete). Checks should be made payable to “Burnt Hills Track Club”.